On March 28, 2010, Harun-ar-Rashid Kaiser, a worker of Chhatra Shibir and resident of Shahjalal Hall of Chittagong University, was attacked by BCL on the train at 8:30 pm. Chhatra League terrorists slaughtered him and dropped him from the train in Chowdhury Hat area after killing him. 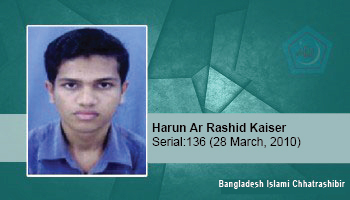 Harun-ar-Rashid Kaiser, student of the second year of marketing department of Chittagong University, was the middle child of three children of Didarul Haq, a school teacher of Raghbpur village under Mirsarai upazila of Chittagong district.